First you need to know that I must be absolutely the most crazy person I know. I mean, as if life isn’t difficult enough with just the every day reality in which I live, but to bring a dog along in the mix is just outrageously nuts!!! I have discussed more dog parks with strangers than I can count and keep track of. I am, in addition to assisting my son in his treatments and out, wrangling a ‘she wolf’. So much so that my other non-broken fingers are trembling with fear every time I have to put on and take off Piper’s chain collar–the culprit of my first broken appendage. But it is now Wednesday and I am happy to report that I, and my digits, are surviving. What, you want to talk about Cole? Cole who? Did you not come to this place to read only about me?! Isn’t this blog, after all, called “BentRivka”??? Cole is, hands down, one of the strongest people I know. He has a tolerance that puts me (and many others quite frankly) to shame. He is working out with needles all over his head, and sometimes face, for 3 hours straight. I have taken a photo of him today on the exercise bicycle. 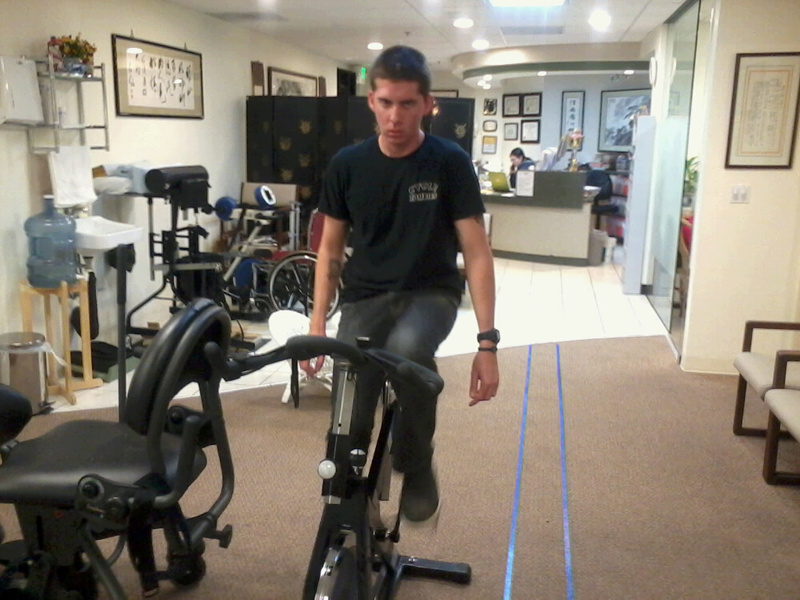 While on the bike he is working on coordination for his left leg, as well as his ability to balance. To work on balance, he puts his arms in different positions while cycling with his legs. This exercise is quite easy for me to do (and probably most of you), which just goes to show how much of Cole’s physical abilities have been robbed. Now regarding what we are seeing with the acupuncture this week. Here is my analogy of the situation as a whole. Let’s imagine we are on a hike and our first leg of the trail involves a steep incline, this means we reach the top quickly. Then, while still ascending, our next hill is a more gradual incline thus the top is reached at a slower pace. You probably get the picture by now…the first week of treatment the results were phenomenal, immediate, and miraculous. This week, while Cole is most definitely still progressing & miracles still abound, the results are more gradual and therefore perceived more slowly. But be assured, progress is still the course. In this you can most definitely rely because it has been an exceptionally trying week for me (see first paragraph, and read between the lines), and if progress was not happening, I can promise you I would be sleeping in my own bed this very night instead of spending another night in our little dumpy hotel (though I love the staff). One more thing…when I am struggling with a low disposition, I think on the Lord and His goodness. I focus on the MANY aspects of life for which I am grateful, AND I count the blessings of, not just my little world, but of the entire world. When I do this, my spirit soars. And when my spirit is soaring I can honestly say, “You’ve got me feeling so fly!”.